Spring is a busy time at Lynch Creek Farm. 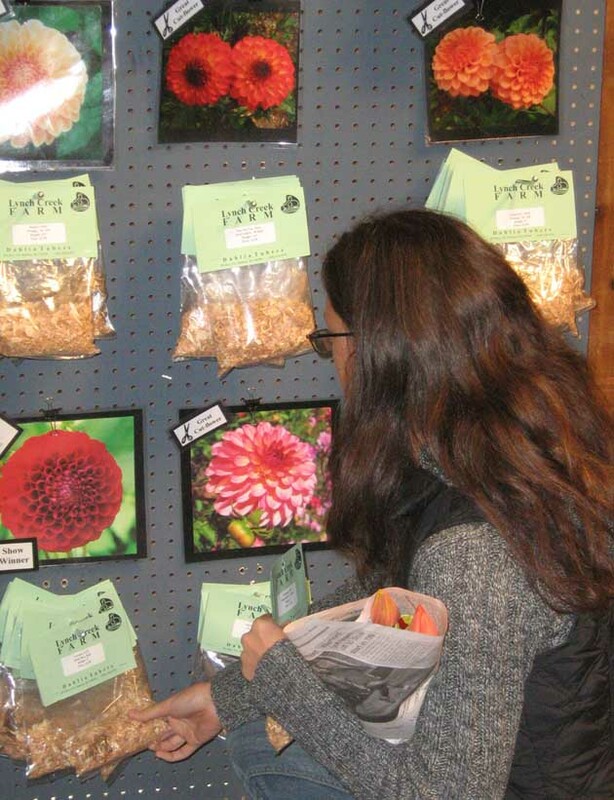 Not only is the staff busy filling and shipping dahlia tubers nationwide, but April marks the opening of the Olympia Farmers Market. Lynch Creek is in its third decade as a mainstay of the market. 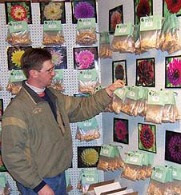 In April and May, the farm's colorful booth at the market features ranks of dahlia tubers, beautifully displayed. The Olympia Farmers Market is located at the north end of Capital Way between Percival Landing and Swantown. All kinds of wonderful fresh produce, meats, seafood, garden starts, baked goods, sauces, honey, shrubs, fruit trees and perennials, dairy products, and handcrafted items like soaps, wooden ware, woven towels, jewelry and paper are available Thursdays through Sundays from 10 a.m. to 3 p.m.
the farmers' market as planting season arrives. When Lynch Creek Farm owner Andy Hunter and his brothers were just youngsters, their dad kept them out of trouble by planting a huge garden. 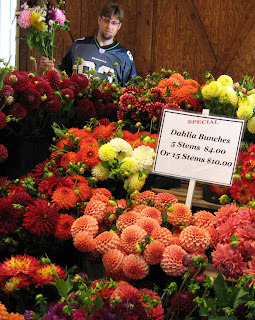 Soon they were marketing their fresh veggies and flowers at the Olympia market, and Lynch Creek has been a presence at the market ever since. add brilliant color to the market. 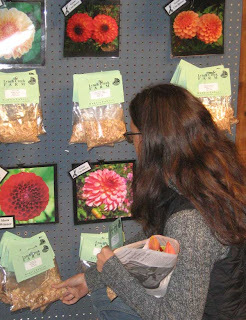 Lynch Creek Farm's booth at the market will have fine dahlia tubers for sale through the end of May. The staff will offer not only healthy dahlia tubers but advice on choosing varieties, soil preparation and planting, and dahlia maintenance. The farm gang will be back at the market with stunning displays of fresh-picked dahlia bouquets and other farm-fresh flowers from late July until the first frost. And when the dahlia season's over, they'll be back at the market with their magnificent holiday wreaths and swags until the end of the market season at Christmas.